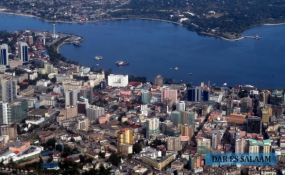 Dar es Salaam — Dar es Salaam is set to change further in the coming months as the city gets one more addition to its rapidly changing face. If all goes according to plan, Dar es Salaam will have a new multi-billion shilling by-pass - known as the Selander Bridge - within three years. The contract to build the $126.26 million (over Sh284 billion) bridge - that will start all the way from Barack Obama Drive to connect the Aga Khan Hospital and Coco Beach at the junctions of Kenyatta and Toure roads - was officially signed in Dar es Salaam yesterday between Tanzania Roads Agency (Tanroads) and GS Construction Company of South Korea. This is one of several projects that are currently on different stages of implementation as the government seeks to curb traffic snarl-ups on Dar es Salaam's roads, a move that would save the economy from a Sh4 billion loss daily. A 2010 study, which formed the basis for the construction of the Dar es Salaam Rapid Transit, revealed that the economy had been losing Sh4 billion every day from traffic jams in the Tanzania's largest commercial city. Besides, workers also spend hours on their way to workplaces (lost man hours) while environmental pollution has also been causing diseases such as cancer, which cost huge sums of money to treat. Other projects - initiated to tame the traffic jams- include the $45 million (about Sh100 billion) Tazara flyover. The project, which is fully-funded by Japan through the Japan International Cooperation Agency (Jica), was projected to be completed by October, 2018. So far, the contractors are putting the final touches to the project. Construction of the Sh177.4 billion three-storey Ubungo interchange - which is funded through a World Bank loan and implemented by the China Civil Engineering Construction Corporation (CCECC) - is currently underway. Situated at the junction between Morogoro, Sam Nujoma and Mandela expressways, Ubungo is one of the city's busiest locations with data showing that more than 65,000 vehicles, including an average of 6000 upcountry and transnational passenger buses entering and exiting the city via the passage daily. In 2016, President John Magufuli commissioned the $135 million (Sh290 billion) Kigamboni Bridge. The government is also on various stages of the wider plan to build seven new flyovers in Dar es Salaam. The new flyovers will be built at the junctions of Chang'ombe, Uhasibu, Kamata, Morocco, Mwenge, Magomeni and Tabata. President Magufuli and the South Korean Premier Mr Lee Nak-yeon witnessed the signing of the contract between Tanroad and GS Construction Company yesterday. The President urged the contractor to speed up work. "With advanced technology that Korea has, I don't expect the contractor to delay the project," said the Head of State. Meanwhile, President Magufuli said he had requested South Korean through Exim Bank to help Tanzania with a soft loan for construction of the Mwanza-based three kilometre Kigongo-Busisi Bridge.